Sustainability Advertising: What is Corporate Social Responsibility? Corporate Social Responsibility (CSR) is a concept whereby organizations consider the interests of society by taking responsibility for the impact of their activities on customers, employees, shareholders, communities and the environment in all aspects of their operations. This obligation is seen to extend beyond the statutory obligation to comply with legislation and sees organizations voluntarily taking further steps to improve the quality of life for employees and their families as well as for the local community and society at large (CSR - Wikipedia). I think it is fair to say that organisations mostly started to think about CSR 10-15 years ago when they began to be increasingly criticised from other groups like Greenpeace, WWF or other pressure groups to change their ways of doing business or at least change some of their ways of managing their environmental and social impacts. CSR then really jumped on top of the global agenda when Shell was boycotted for the way it dealt with the disposal of the Brent Spar (Brent Spar). After this boycott nearly bankrupted Shell, organisations all around the world started to take notice and developed their Plan B for public relations disasters like this. This was when CSR was born. 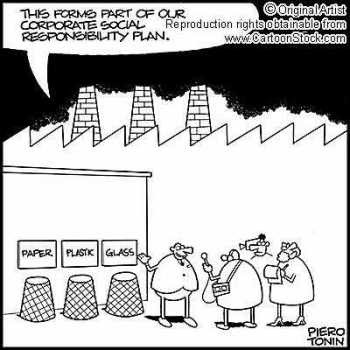 This Plan B called CSR quickly developed into a more comprehensive list of actions and responsibilities and in the end to a complete management framework on how to (1) manage the expectations of your stakeholder, (2) change and manage the way you do business more responsibly and (3) take care of your environmental impacts. There are more areas to CSR but I think these three are the most known ones and good to start with when first reading about CSR. CSR since then has grown continuously into a-must-have for organisations around the globe. No matter whether they have a complete management framework for CSR in place or a policy of some kind, CSR is different from one company to the other and needs to be a tailored approach to managing the responsibility within our society of this particular organisation. There are obviously good and bad examples in the world but overall one can say that CSR been promoting responsible business practice in the world. And this is a good thing. If you are interested in finding out how your company can participate or learn more about CSR, sustainability and what LOHAS is please e-mail Diane Lund at Creative Wonders (diane@creativewonders.ca). She would be happy to chat with you about it.